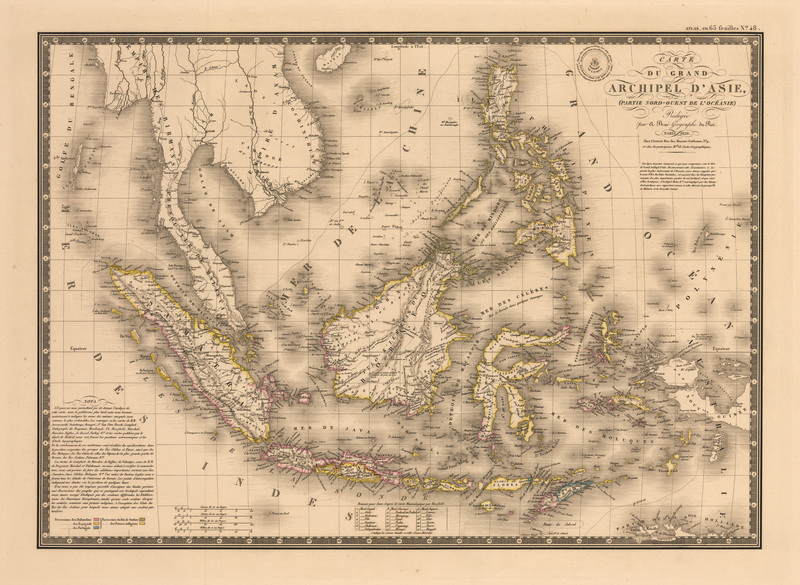 Home > Pacific Ocean > 1826 Carte du Grand Archipel d’Asie, (Partie Nord-Ouest de l’Oceanie). 1826 Carte du Grand Archipel d’Asie, (Partie Nord-Ouest de l’Oceanie). This splendid copper engraved double map by Brue features the Grand Archipelago of Asia, along with annotations regarding the entire area depicted. The large map is highly detailed in every aspect. It is printed on heavy paper with wide margins, and includes the raised French royal seal, script title and keyboard border. Lovely, original outline coloring with a color-coded key embellishes the map. Adrien-Hubert Brue (1786 - 1832) was a French cartographer active in the late 18th and early 19th centuries. He held the office of Geographe du Roi and often signed his maps as such. In this position Brue contributed to thousands of maps and numerous atlases. His maps are known for their beauty, their clarity and accuracy. Many of his maps were published posthumously. Pierre-Jacques Picquet, the son and heir of his partner Charles Picquet, published the maps following the death of Brue, and they continued to be updated and republished for decades. Brue’s work is distinguished by a remarkably high standard of engraving and the high quality paper which he used. Condition: The engraving of this map is of exceptionally high quality. The map is in A condition.